Well, this is awkward. I've started crafting the ending levels of TAGAP 3 and as always, that starts with creation of assets – characters, backgrounds, what have you. And right now I'm working on █████████████. Yup, that's all I'm saying, anything more would be a bunch of spoilers. Sorry. "Entity"is an in-game object with (dynamic) properties (everything interactive and/or moving). This is pretty incomparable statistic; TAGAP 3 has large, sprawling levels, whereas TAGAP 2's levels were split into multiple short segments. Plus TAGAP 2 has a separate co-op variant of EVERY map. So, no, TAGAP 3 isn't this much shorter. Voiceovers for TAGAP 3 haven't been recorded yet, so this statistic will jump up quite a bit in coming months. These statistics are shown without music for more accurate comparison. This is simply because TAGAP 3 soundtrack is not yet ready and is not contained in the standard in-house distributable version of the game. You know, so that when I copy a new version of TAGAP3 to Petja, the older demos I have won't overwrite newer versions he is currently testing. 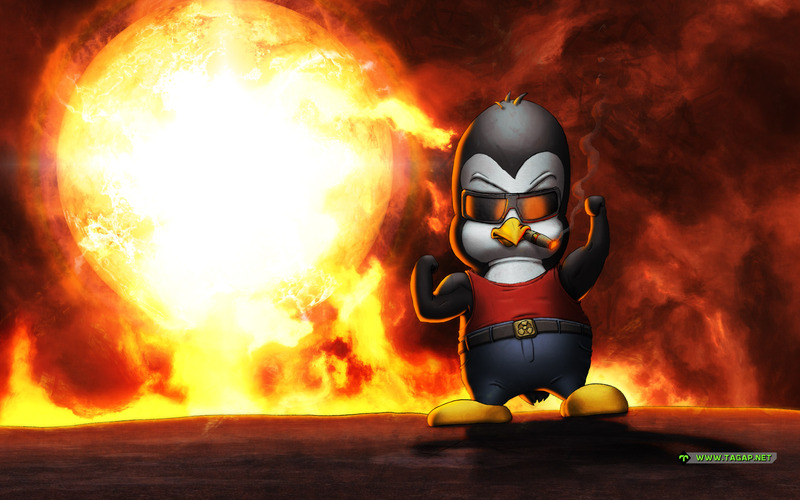 In case you missed it, here's special penguin art for the 20th anniversary of Duke Nukem 3D. Naturally also available as wallpaper! Last time we skipped the playlist update, focusing exclusively on TAGAP Day stuff. Thus we have some catching up to do. First off is Hard Reset Redux. I remember giving this game a go with Petja's PC when it was first released way-back when and it always stuck with me. My PC wasn't capable of running the game so I never got to it proper, but it certainly left an impression on me. How do I know this? When I started playing this, with a joyful glee my brain said; "Oh this was the fun action game that inspired you to make TAGAP3's robots explode with electricity flying all over the place!". So, it's a fun romp and well worth checking. The story is bonkers, but it's not like you'd play 'cyber-punk-themed spiritual successor to Painkiller' for its writing. Only iffy part of it all is the frame-rate, which on PS4 takes a nosedive in certain late-game fights. It's not disastrous, but it is very noticeable, especially since I've been playing the buttery-smooth DOOM so much recently. Next up was The Technomancer, Spiders RPG set in the universe introduced by Mars: War Logs. I really liked that world and was overjoyed to see a sequel. Good news is that it didn't disappoint. What I love the most about these games is how grounded they are; Despite being about space-mages on colonised Mars, they don't meander into cliché fantasy epic-ness, but remain grounded. All in all, with Mars: War Logs, The Technomancer and Of Orcs and Men, Spiders is quickly becoming my favourite RPG studio. What their games lack in BioWare production values, they compensate with heart, ideas and atmosphere. They have rough edges, for sure, but I think it gives these games more charm. Finally got around to see this one unfold. Before I even start, I have to say that I didn't like Man of Steel, the first entry into the DC cinematic universe. I can illustrate this best thus; Legendary pictures also made Godzilla (2014) and not only does their Big G come across as more heroic, but I'm pretty sure he also causes less destruction than Superman in Man of Steel. And when your Godzilla comes across more of a hero than your Superman, you have problems. This brings us to Batman v Superman: Dawn of Justice, a film that seems almost reviled among critics. It was just released on BluRay here recently and despite its monstrous length I watched the extended cut. As you can tell by the blog header, I seriously loved this one. First off, Superman has an arc now and comes across as a hero with the weight of the world on his shoulders. It's something that should have happened in Man of Steel already, but now pays off nicely. In fact all the principal characters have their arcs except for Lois Lane, who is still basically just the damsel-in-harms-way. But the real star of the film? It's Ben Affleck's Batman/Bruce Wayne. I admit, his Daredevil was what made me extremely sceptical of the casting, but goddamn it works. On top of that, this Batman clearly mirrors the 80s Bat-classics – as written by likes of Miller and Moore, and as drawn by Miller, Bolland and MacFarlane – with sprinkling of Arkham trilogy flavours on top. So yeah, if you want to see one of the best live-action versions of Batman to date and don't mind ridiculously long action films, consider giving BvS:DoJ:UE a go. Even if you disliked Man of Steel, you may find this one grand; That happened to me. Finally, there's Suicide Squad, the first movie since Avatar I went to see in a theatre. And yes, the theme of liking-stuff-everyone-seems-to-hate continues as I enjoyed the film quite a bit. I already confessed my love for Affleck's Batman, but Leto's Joker is also insanely intense, Margot Robbie is spot-on Harley Quinn and Will Smith can deliver one-liners like no-one's business. It's dumb as rocks, sure, but as super-anarchistic anti-Avengers it works. All this said, there's one thing holding the movie back; The editing. There are rumours of why this happened, but the results are nothing short of schizophrenic. Luckily the film stars a bunch of nutcases, so it kind-of, sort-of fits. Still, it's been ages since I've seen another film I want so desperately to be re-released as a director's cut. In summary; Suicide Squad is a fun, dumb-as-hell action film set in a 'cinematic universe' that is starting to grow on me. And by the powers that be, I really hope Affleck's Batman solo-film features Leto's Joker. I want to see these two going head-to-head proper. Phew, that's it for now. Next time I'm hopefully working on something less cryptic so we can stay on topic!